The Cleveland Cavaliers just put Mo Williams’ face on the box of a milk cartoon because they can’t seem to locate their starting point guard. According to the Game 4 box score, Williams had 18 points on 5-of-15 shooting, had five rebounds and had two assists and two steals. That’s odd because when the LeBron James needed help when things got hot and heavy in the fourth quarter and in the overtime period in Orlando, Williams was nowhere to be found. With Williams missing in action, James had to do too much on offense and could not save the Cavaliers from going down 116-114 to the Orlando Magic in Game 4 and could not save the Cavaliers from going down 3-1 in the Eastern Conference finals. Only eight teams have overcome a 3-1 deficit in a seven-game series. Did you guys hear something? I swear I just heard Mo Williams say “I’m a leader on this team.” Is Williams living in the same planet? Has he been paying attention to this series? Obviously not based on his comments. A leader? I know Williams has a sense of humor, but that last one was just hilarious. And this is coming from a guy who just guaranteed that the Cavs will win this series. Before Williams is allowed to make any predictions, he needs to get in the game first – and when I say “get in the game” he needs to have a bigger impact in the game other than inbound the ball to LeBron, who is averaging 42 points in the conference finals but yet finds his team on the brink of elimination. To say that Williams is having a hard time in this series is the understatement of the year. Williams is 23 for 71 from the field in the series and has been hardly as efficient as he was in the regular season, when he averaged a career-high 17.8 points. For someone who was tabbed as the LeBron’s wing man and made the NBA All-Star Game this season, Williams is playing like a guy who is afraid to make a play. The fact that he made the guarantee shows that he’s lacking confidence and he needed to pump himself up with some verbal bravado. He had 18 points through three quarters on Tuesday, but took just two shots (missed them both) in the fourth quarter and overtime. He is getting outplayed by Rafer Alston and is still reeling from the elbow he took to the face from Anthony Johnson. 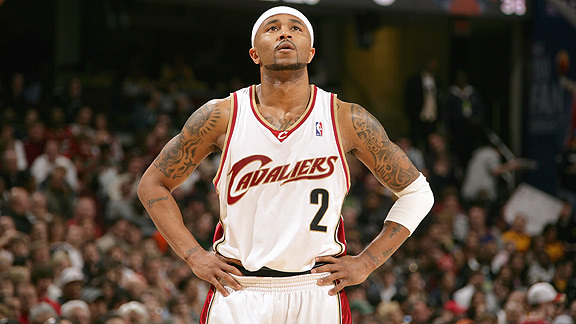 If the Cavaliers are going to extend this series, Mo Williams needs to man up and let his presence be known.